We awoke to the sound of birdsong echoing through the trees, mixed with the low hum of a ticking car engine. We discovered a few other walkers had finally arrived, as it was the weekend, to explore this beautiful national park. We had a long walk planned for the day but still had a very slow start, taking time over our breakfast in the glorious morning sun. We finally got ourselves moving around 11am and headed off into the forest, initially following the same easy trail as the previous night. 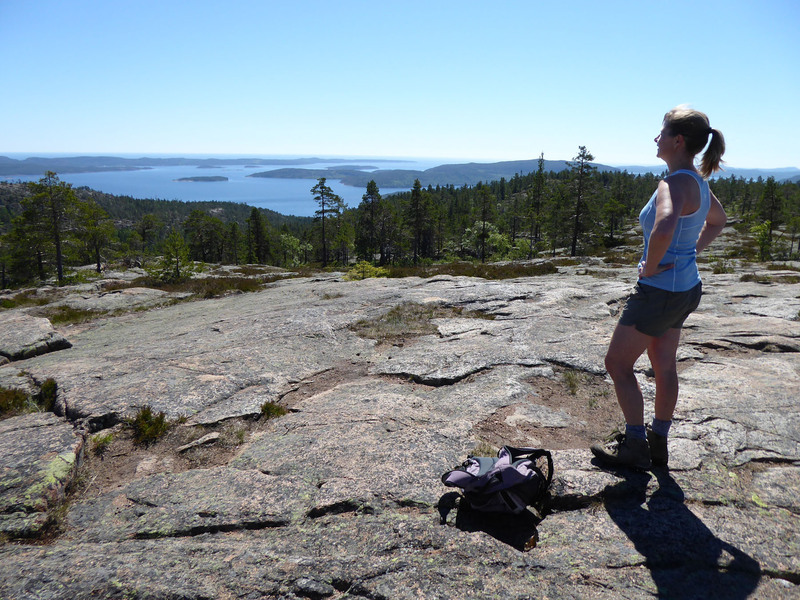 We soon turned off the path and dropped steeply down to the shores of Långtjärnen. We circled the north edge and continued on through neat paths threading their way by ever-present fir trees, where we reached the forest opening of Norrsvedjebodarna. 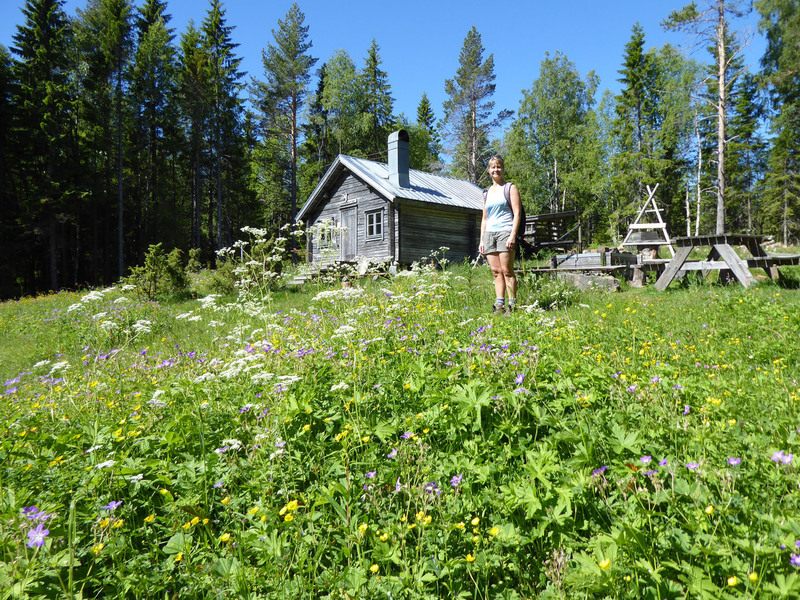 This was a beautiful meadow with a free to use camping cabin, fire pits and picnic tables. 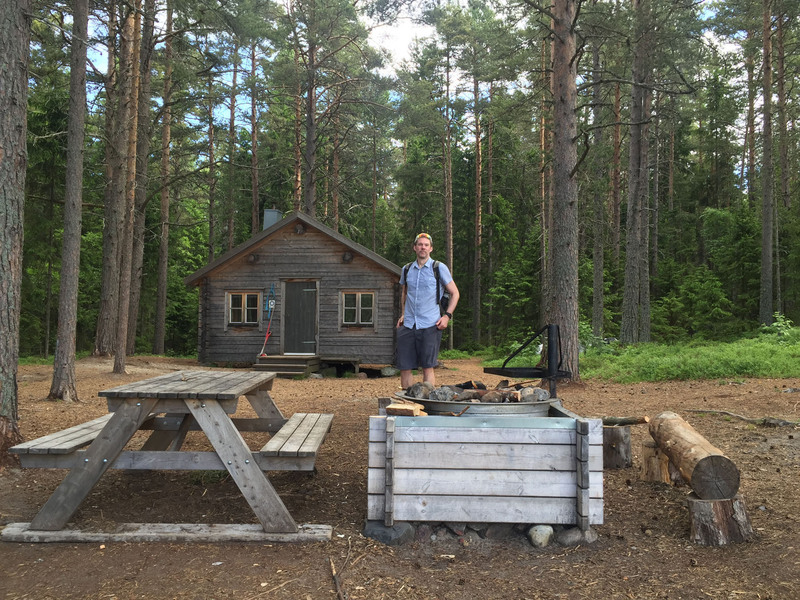 We had a look inside the beautiful timber cabin, fully kitted out with beds, kitchen and log fire, signing the visitor book with a message thanking Sweden for being so awesome. 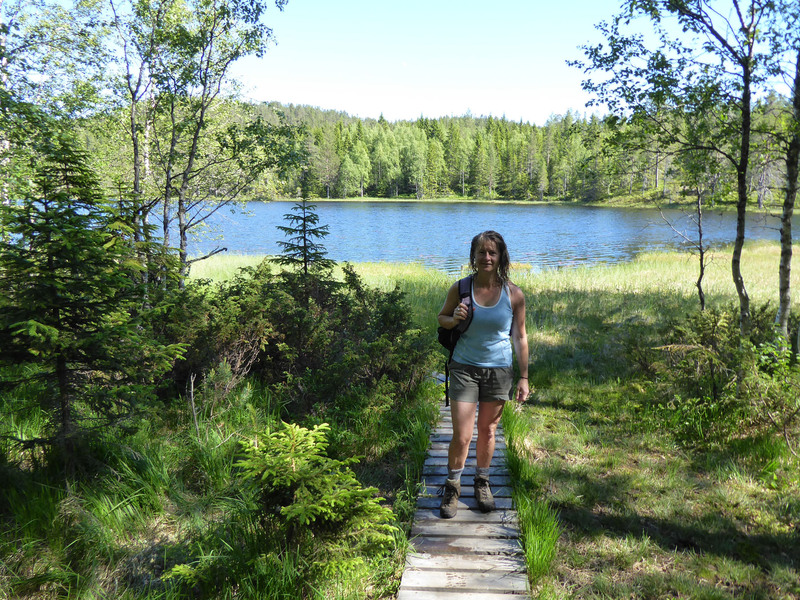 Near to the cabin was a small path leading to lake Skrattabborrtjärnen, a very inviting, sun-warmed waterhole that we would definitely return to later. 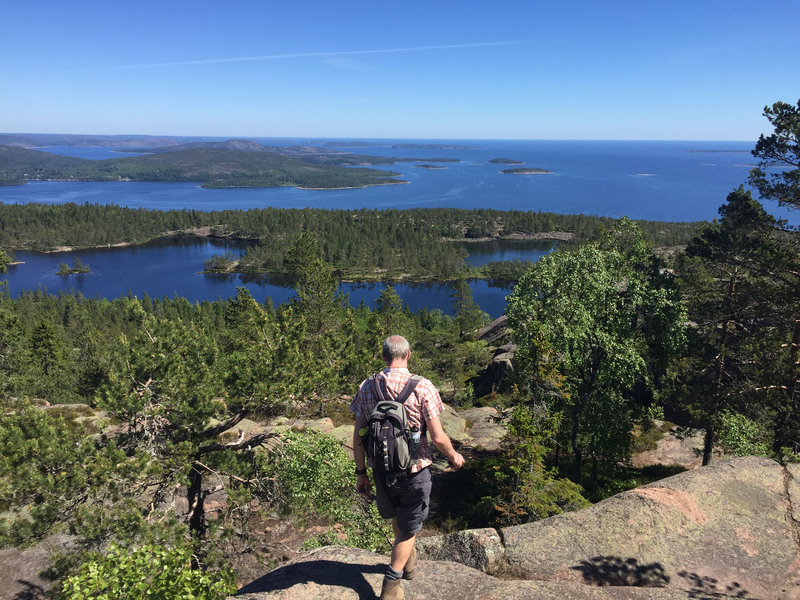 The path continued around the lake, climbing on to a high plateau with incredible far-reaching views out over the islands and the Baltic Sea. The path was strewn with twisted and withered white trees, their gnarly forms intricate and fascinating. The sun continued to pour down on us, making the walk sweaty work, but we were so glad for the clear, cloudless skies. Again we dropped steeply down from the plateau, finally passing some other hikers, an organised group outing it seemed, coming up the same path. 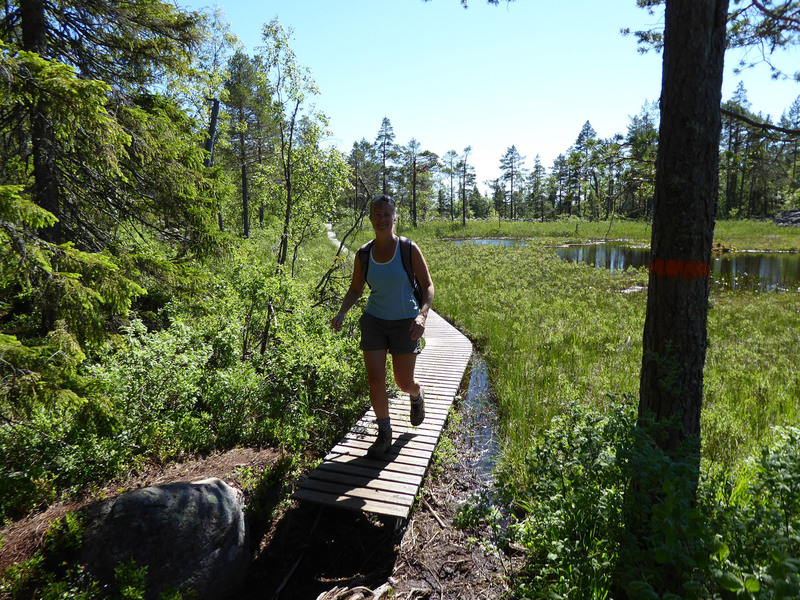 We were now near to the main long-distance coastal path that passed through Skuleskogen National Park, so we certainly expected to see a few more walkers now. 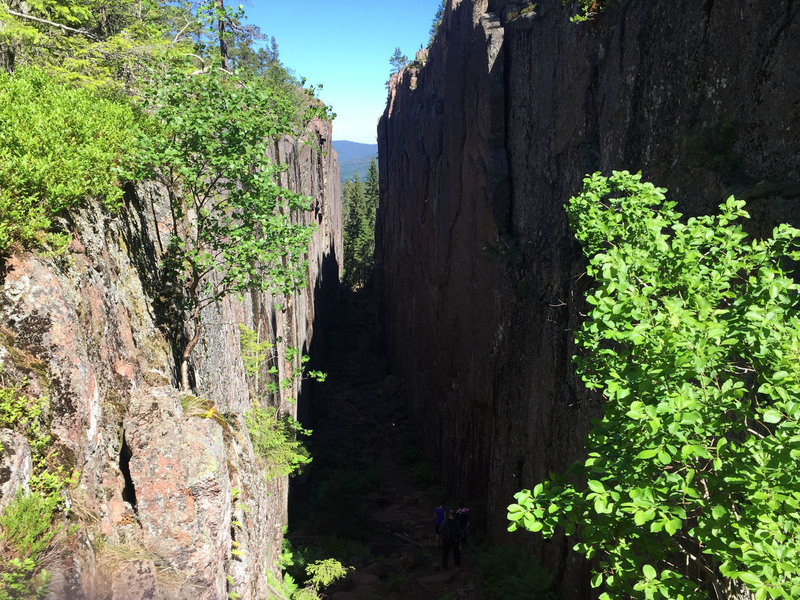 We turned north up the wider, well-walked path and after a short scramble over a discarded boulder field, we reached Slåttdalsskrevan, a deep, wide chasm in the rock, and a key focal point for many walks in the park. The steep sided cleft in the rock face left a deep cavity, filled with mossy boulders at its dark, ever-shadowed base. We climbed up over the left-hand side where there were again incredible views out over the coastline. Below us there was a many-islanded archipelago, green splodges of land scattered at random intervals in the beautiful, calm sea, all framed within a backdrop of light blue sky and wispy white cloud. We found a nice spot on the flat rock above the chasm and ate some snacks, savouring the calories along with the exceptional view. From here we retraced our way a little, before climbing up over Slåttdalsberget, a high ridge running parallel to the main hiking path. 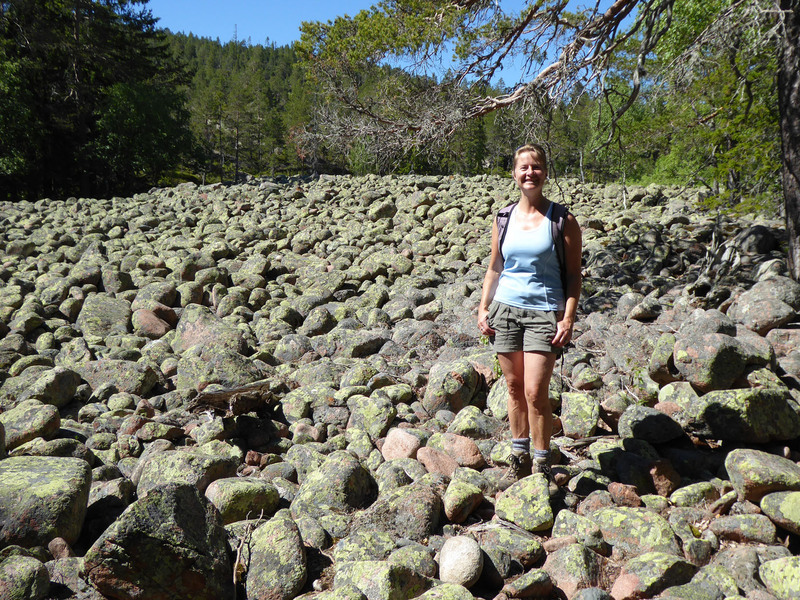 The route was marked with helpful cairns and had scatterings of pretty white flowers growing wherever small pools of standing water were found. 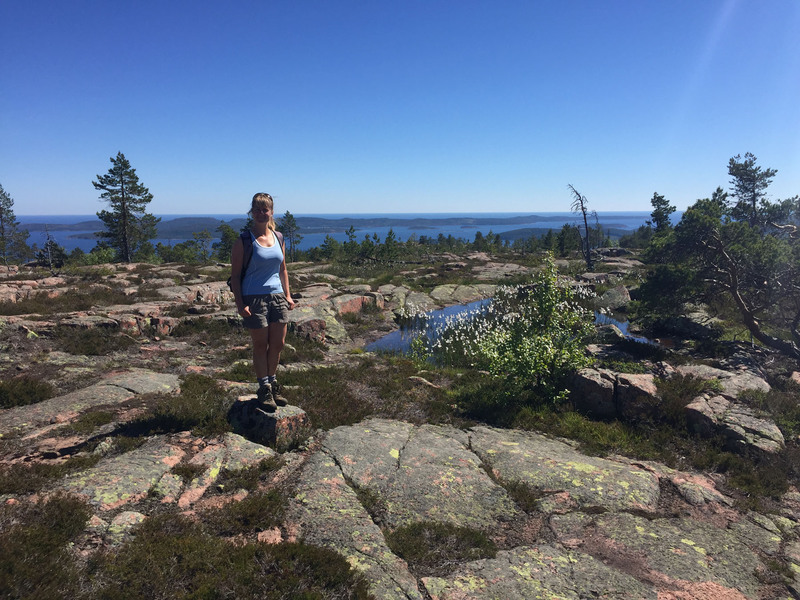 The same incredible views over the forest trails and out to sea greeted us as we walked, loving the easily accessible beauty of this rugged coast. With the view implanted on our minds, we finally dropped off the end of the ridge, re-joined the High Coast Trail path north for a little while, before turning west and headed back the same route we had arrived on. 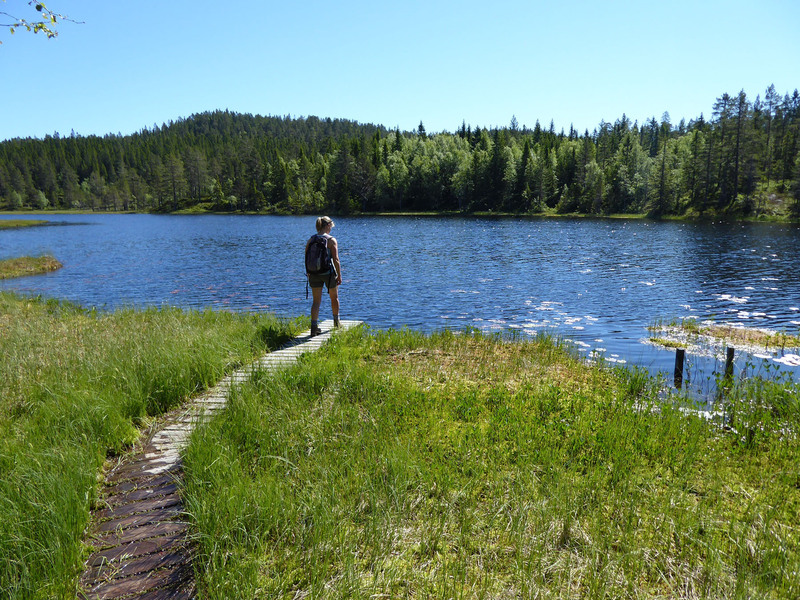 We paused again at lake Skrattabborrtjärnen, near the camping cabin, and enjoyed a very refreshing dip in the lake we had promised ourselves earlier. We played around, jumping off the wooden pontoon into the idyllic peaty lake surrounded by trees and with intermittent water-lilies peppering the calm surface. It was so lovely to jump into the water like carefree loons, cooling off from our trek and enjoying its refreshing coolness caress our hot skin. Refreshed, we returned to Benny and passed another simple, very pleasant evening in the quiet forest, with all other day visitors having completed their walks and left us in total peace, alone with the birds. We woke early the next morning and left the west entrance, driving a short loop around to park up at the north entrance, positioned on the coastline. This was a similar set-up with the same buildings, but with more signs of life; there were seven other motorhomes parked up here, along with quite a few cars. We wanted to do a more low-level walk, to taste a little of all the varied environments available within the park. We walked south, through very similar terrain, enjoying an easy and mostly level trail through the fir trees and along the water’s edge. 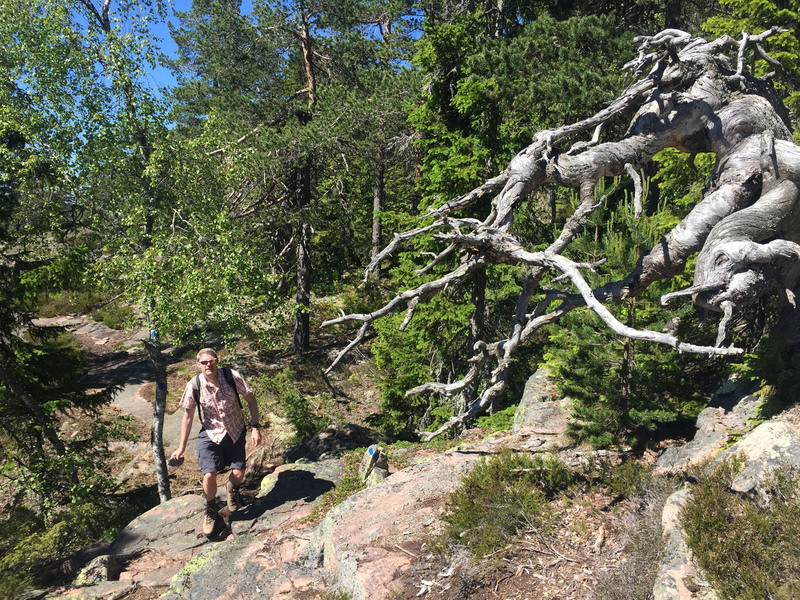 We reached the turn for Tärnättholmarna, an island group that is now reachable by foot across a natural causeway. The land has risen from the sea and sand had silted up to create the causeway that now linked the island to the mainland. A smaller island sat behind the larger, and we rested here a while simply staring out to sea, its metronomic regularity mesmerising. Both islands had timber cabins available and would be beautiful camping spots, with wood seats, fire pit areas and a multitude of swim spots, and we could easily have passed a few peaceful days here enjoying nature. 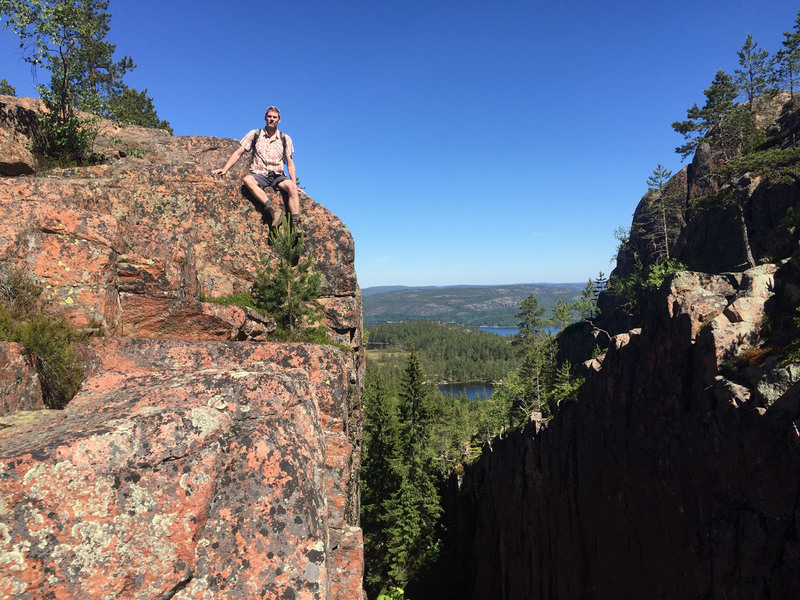 We returned to the mainland and, to make our outing a circular route, we took a steep uphill path to Gamm Bodarna, gaining height quickly on the wet path. 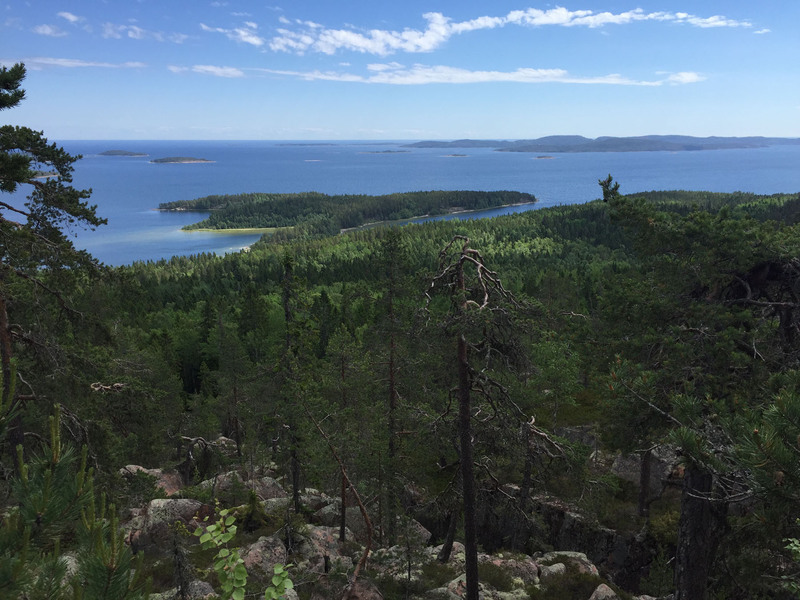 This brought a lovely coastal view back over the islands we had just left, before the path headed back into the trees to two inviting lakes at Tärnättvattnen. After our many swims over recent days, on this occasion we managed to resist jumping straight in. We overnighted at the North Entrance and enjoyed another tranquil night in the wooded wilderness, most other visitors having left again. 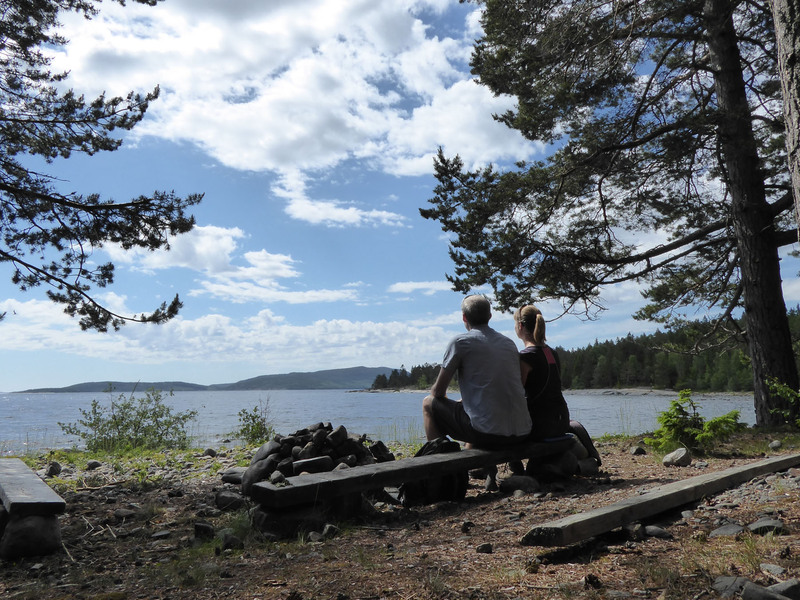 We continue to delight at the expansive size of Scandinavian countries relative to their low populations and at how easy it is to find a beautiful spot to call your own. 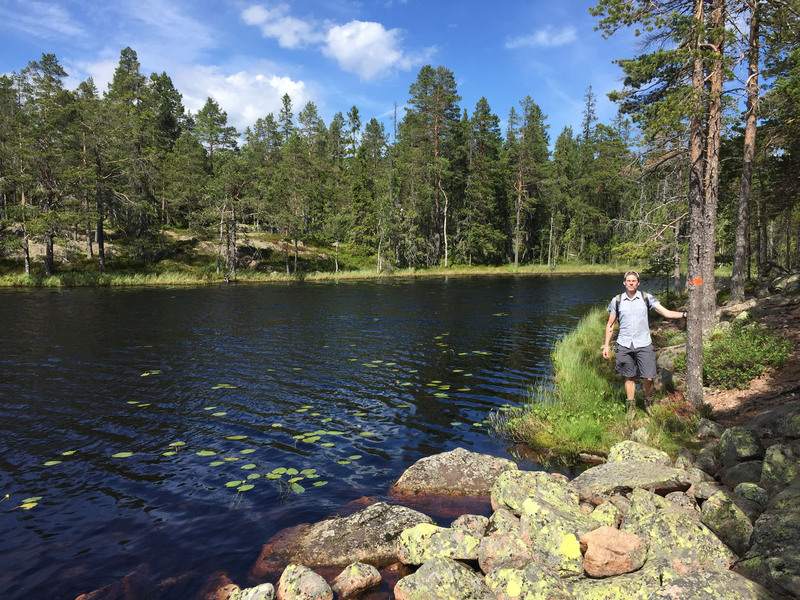 This entry was posted in 2017 Scandinavia Tour, Hiking, In Sweden, Our Travel Journal, Sweden, Swimming on Jul 17, 2017 by Aaron Hill.